Sydney, Australia -- The shape of a Buddhist singing bowl used for meditation has inspired an Australian scientist to re-think the way solar cells are designed to maximize their efficiency. Niraj Lal with his singing bowl. 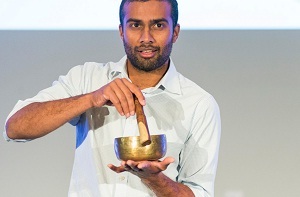 Niraj Lal, of the Australian National University, found during his PhD at the University of Cambridge, that small nano-sized versions of Buddhist singing bowls resonate with light in the same way as they do with sound. He’s applied this shape to solar cells to increase their ability to capture more light and convert it into electricity. “Current standard solar panels lose a large amount of light-energy as it hits the surface, making the panels’ generation of electricity inefficient,” says Niraj. Normally used in meditation, music, and relaxation, Buddhist singing bowls make a continuous harmonic ringing when the rim of the metal bowl is vibrated with a wooden or other utensil. .....this doesn’t look like much, does it? Ah, but that picture shows so, so much. It shows everything! That’s us. You, me, everyone. That fuzzy blob on the left? That’s Earth. The one on the right: the Moon. In this one simple picture, you can see everywhere humans have ever been; hundreds of thousands of years spent on Earth, and a few brief days on the Moon. And this picture was taken from much farther than anyone has ever traveled. ...Researchers at the University of California, Berkeley, tracked how closely the emotions of seasoned meditators and professional dancers followed bodily changes such as breathing and heart rates. They found that dancers who devote enormous time and effort to developing awareness of and precise control over their muscles do not have a stronger mind-body connection than do most other people. In his latest book, Social Intelligence, Daniel Goleman, author of the best-seller Emotional Intelligence, illustrates how new clinical results in the fields of neuroscience and biology show that humans are in fact wired for empathy - that without any conscious effort, we feel the joy, pain, anger, and other emotions of the people around us. Sharon Salzberg, co-founder and teacher at the Insight Meditation Society in Barre, Massachusetts, spoke to Goleman this summer about the emerging field of social neuroscience and its implications for the principles and practices of Buddhism. 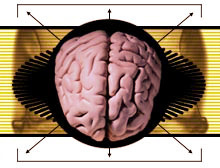 Cognitive Brain: An interesting look on how our brain groups information together to be able to process patterns and familiar situations. But this might also lead to difficulties with introducing new material into a familiar situation. In the 1940s, the Dutch psychologist Adrian de Groot performed a landmark study of chess experts. Although de Groot was an avid chess amateur – he belonged to several clubs - he grew increasingly frustrated by his inability to compete with more talented players. De Groot wanted to understand his defeats, to identify the mental skills that he was missing. His initial hypothesis was that the chess expert were blessed with a photographic memory, allowing them to remember obscure moves and exploit the minor mistakes of their opponents. De Groot’s first experiment seemed to confirm this theory: He placed twenty different pieces on a chess board, imitating the layout of a possible game. Then, de Groot asked a variety of chess players, from inexperienced amateurs to chess grandmasters, to quickly glance at the board and try to memorize the location of each piece. As the scientists expected, the amateurs drew mostly blanks. The grandmasters, however, easily reproduced the exact layout of the game. The equation seemed simple: memory equals talent. But then de Groot performed a second experiment that changed everything. Instead of setting the pieces in patterns taken from an actual chess game, he randomly scattered the pawns and bishops and knights on the board. If the best chess players had enhanced memories, then the location shouldn’t matter: a pawn was still a pawn. To de Groot’s surprise, however, the grandmaster edge now disappeared. They could no longer remember where the pieces had been placed. For de Groot, this failure was a revelation, since it suggested that talent wasn’t about memory – it was about perception. The grandmasters didn’t remember the board better than amateurs. Rather, they saw the board better, instantly translating the thirty-two chess pieces into a set of meaningful patterns. The advice was further refined a few years ago as a result of feedback and new research. The aim of pacing is to remain as active as possible but to avoid the relapses resulting from over-exertion. Patients may try to increase their activity levels every few days, as long as they remain “within the limitations which the disease imposes” (Ramsay. Medical Update 1990, no. 1). In practice, pacing means stopping an activity when you feel you have reached that point where pleasant tiredness becomes unpleasant, where arms or legs begin to feel weak, or where one starts to feel unwell or sick. Some might find it more helpful to rest for a while at the first sign of muscle weakness. As Dr. Ho-Yen wrote in his book, “learn to listen to your body. It will tell you when there is a problem”. Making a rough plan of one’s activities for the day or days ahead is fine as long as you rest when you feel you need to. Pacing does not require you to set goals and achieve targets. The idea is to make limited energy go further. For instance, you can make a list of things which need to be done per week. Make sure you allow some space between the most tiring of the activities. If you still do the housework yourself, wash one day, hoover the next. Also, try to include at least one quiet day after something particularly stressful or exhausting. If you are severely affected, you may require three free days, or even a week or more. You will know from experience how you tend to respond to various activities and what you can manage per day without exacerbating the illness. Some specialists recommend keeping a diary. This should include details of activities and symptoms, as well as food eaten and any stressful events. As most relapses do not occur at random, diaries can help you to identify triggers and reveal the relationship between exertion and symptoms. In the beginning, it is also useful to include an assessment of one’s emotional state, as stress saps your energy and undermines your immune system. Your friends may matter to you in ways that you can't even see - at the level of neural circuitry in the brain. It turns out that the brain's frontal midline, an area between the two hemispheres that is associated with socialization and the way you think about yourself, also shows a greater response from friends than strangers, even strangers with similar interests and lifestyles, said Fenna Krienen, graduate student at Harvard University and lead author of a new study on the subject. "What we ended up finding is that closeness really seems to matter to these circuits in the brain much more than similarity," she said. Groovy dancing shows male health, so shows that you'd be a good mate (genetically speaking).